Welcome to Where Bloggers Create 2013. I am so glad that you are here and can't wait to show you where I create. 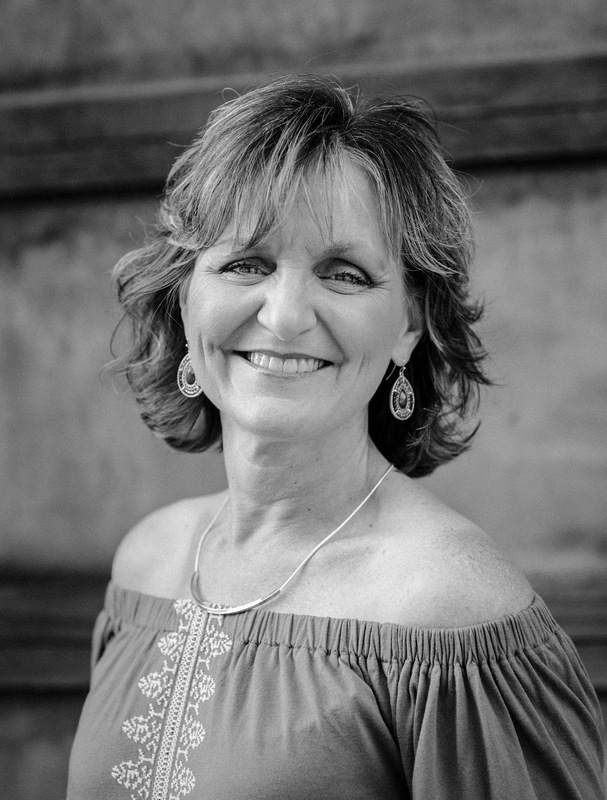 My name is Sheila Rumney (formerly Blessed and Distressed) and I am so excited to share my creative space with you. My sweet hubby and I created this space shortly after we purchased our home. Before it was an unfinished basement that we transformed it into my studio, our movie room and rec room where we spend much of our family time. Clara M., my dress form, greets everyone who enters this area. 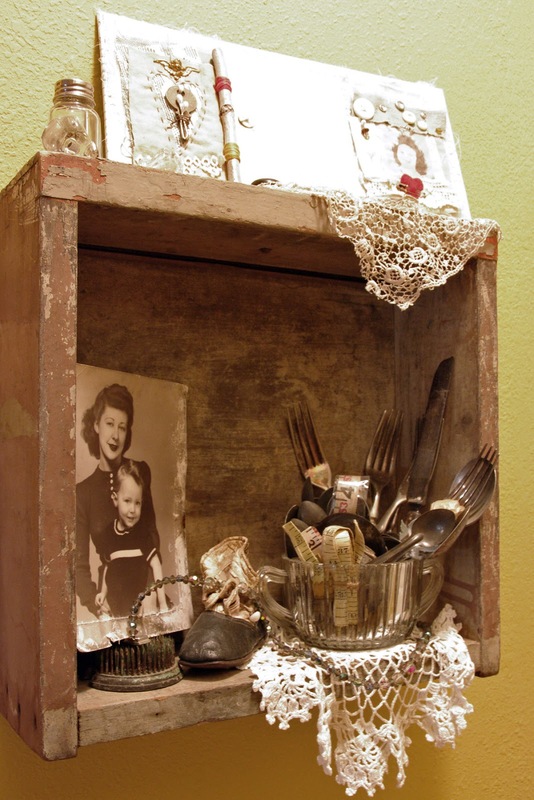 I have a long hallway that holds creative treasures in my cabinets and on the other side I create little vignettes housed in vintage drawers hung on the wall. 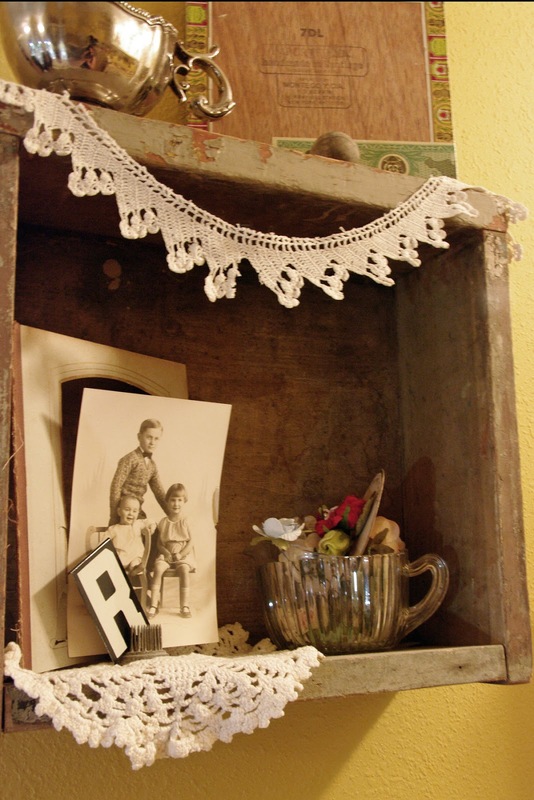 I love incorporating family photos, lace, vintage embellishments just waiting to be used and treasured artwork that I have created. I also spend a lot of time here at my studio computer desk creating digital and hybrid artwork with a vintage feel. Currently, I am working on opening my own digital shop and can't wait to share it will you all! 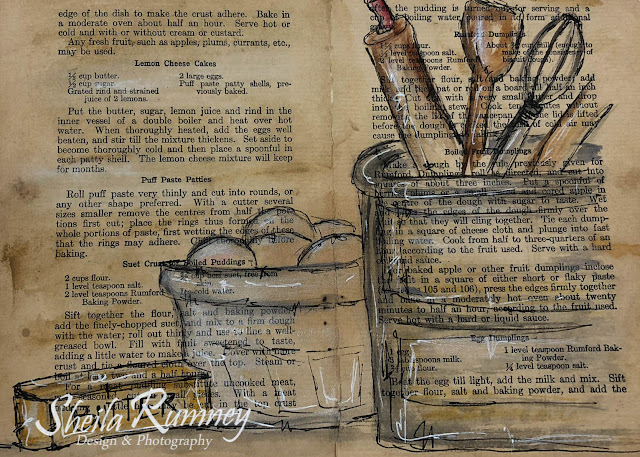 New to digital creating... click on my tutorials above and you too can start creating digitally. 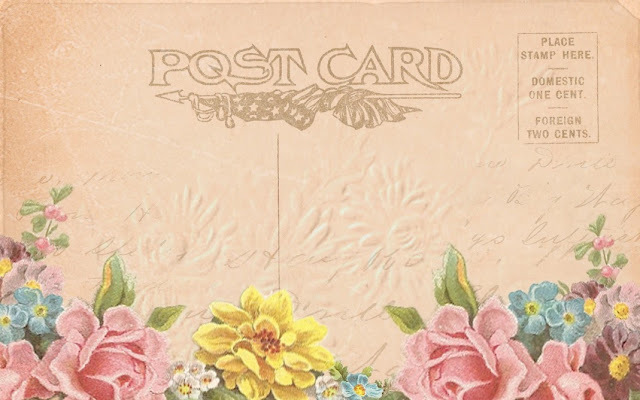 As a thank you for visiting me, everyone can enjoy a sampling of a digital postcard that you can use in your personal artwork. Sign up as a new follower (or if you are already a follower), please comment below and you will be entered to will this Hope Art Neckace. Thank you for visiting and I hope you enjoyed your time here. 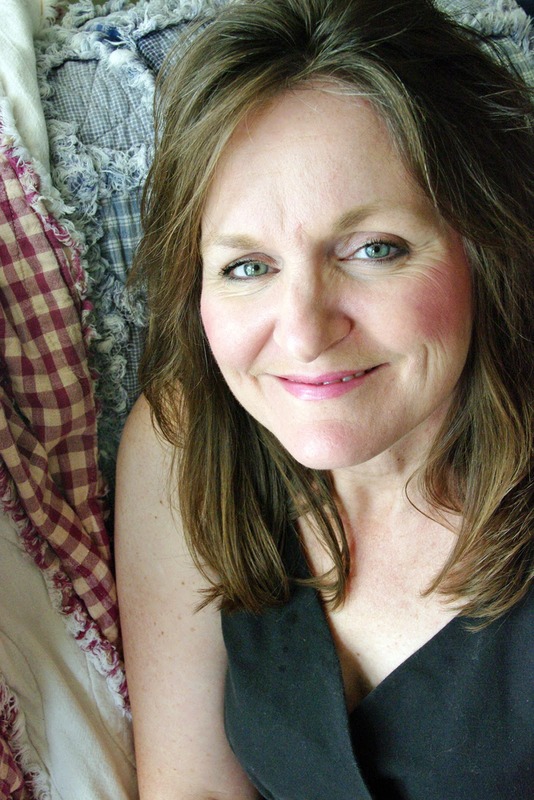 Thank you Karen, for again hosting Where Bloggers Create! 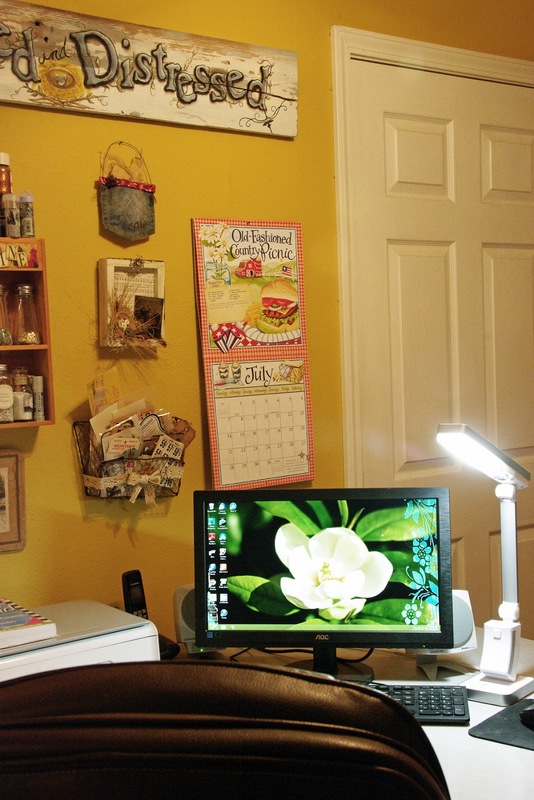 I am off to see all the other creative Blogger Spaces... Won't you join me? Beautiful space you've created, and thank you for the beautiful postcard! Absolutely beautiful space to create. Thank you so much for the lovely postcard and congrats on your new venture! Take care. Im having fun hopping around checking out these creative spaces! Love your shadow boxes! just wonderful. and Im now a new follower! Wonderful space to create in!! Love love the idea of using old drawers as shadow boxes. Thank you for sharing your creative talent with all of us. I love Clara...and your pretty vignettes in the drawers. What fun it must be to re-arrange every now and then! I'm a new follower now, and I look forward to reading soome of your tutorials. Thanks for sharing the postcard and for the chance to win that beautiful necklace! Very lovely and bright space, I like all the white cupboards that holds your supplies. Hi Sheila! Beautiful space and I love the vignettes! I love how you've made shadow boxes on the wall to display some of your treasures - so creative. I am already a follower and I adore that beautiful necklace. Well you know I'm loving all your vintage goodies, and Clara is fabulous! Lucky You!! So glad you could join us for year 5 girlfriend!! So happy to be visiting your creative space . . . it's so lovely! (And thanks so much for the vintage postcard! That was awesome!!) I am so enjoying my visits at everyone's creative places!!! Wonderful to meet you! You have a charming studio and it was kind to to give visitors the postcard. Thank you. All best luck on your new path! Your space is so lovely and has that sunny feel that only yellow can provide. Love that you name your dress form, I did too LOL. Keep smiling and creating thanks for sharing. 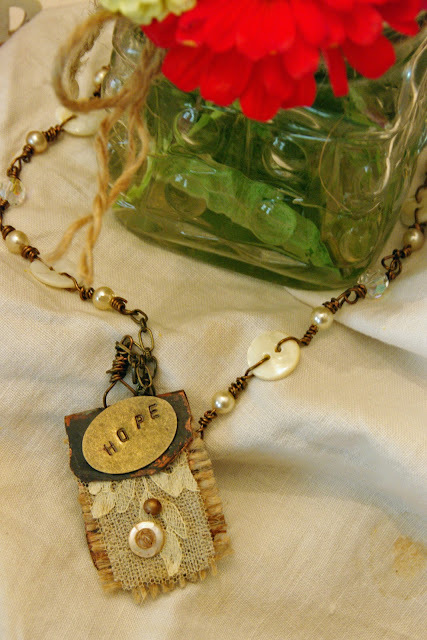 Hi Sheila, Thanks for sharing your wonderful creative space, love your beautiful vintage creations! LOVED MY VISIT HERE TODAY. 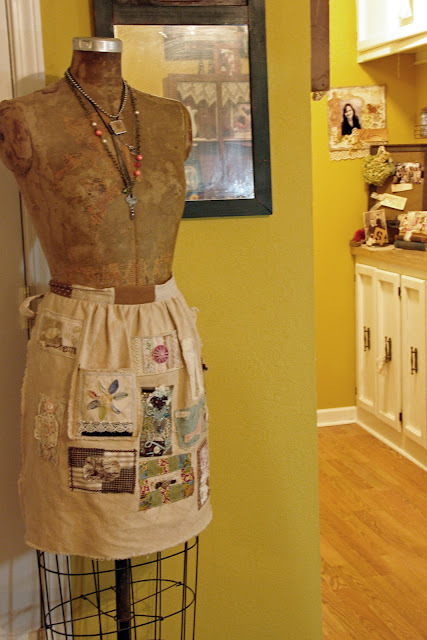 LOVE THAT APRON, IT INSPIRES ME. LOVE HOW YOU USE DOILEYS IN YOUR DISPLAYS. AND THE POST CARD IS SOMETHING I WILL LOVE FOREVER. HOW KIND OF YOU TO SHARE. You have a great place for creating. And thankyou for the digital post card. Very nice creative space. I like your vintage decorations. Love the dress form and how she greets us. I've been a follower for awhile and love the inspiration! Good luck with your new business! Sheila, I love your creative space. All those lovely vintage vignettes have to inspire you. 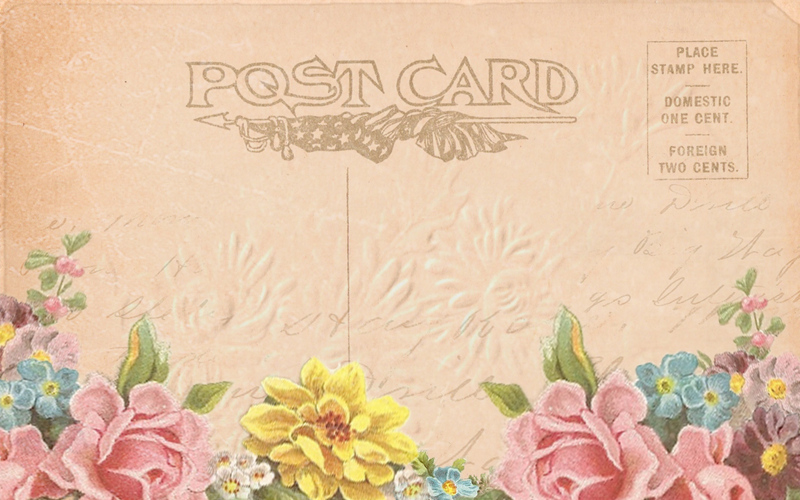 Thanks for sharing your studio with us...and thanks for the lovely vintage postcard. I will have so much fun using it! Lovely creative space and very generous of you to let us participate in your beautiful giveaway. I LOVE the old boxes you have on your walls, filled with antiques and old photos... awesome! Best of luck in your new digital venture and thank you for the postcard image! New Follower here, so glad to have found you thru the WBC party! Love your space and I can't wait to see what you have planned for your new venture. I am right on the edge of jumping into digital art and will be emailing you soon for your favorite sites. I love your studio! I would love to win the necklace. Thanks for the chance. Lovely tour. Enjoyed seeing your work. Great space!! Thanks for shaing!! I really like your digi postcard, thanks, I'll be saving it to use! I love the use of the drawers for your displays! Thank you for the tour.